It’s amazing how quickly a slip of the tongue will come back and haunt you. John Lennon knew about that when he made his comment that the Beatles were more popular than Jesus. Well, Hillary Clinton is the newest victim of the dreaded foot in mouth disease. The media has been running wild with her comment about the assassination of Robert F. Kennedy. She may have effectively hung herself politically. That would be too bad. She’s a fighter. Her go down swinging attitude I find refreshing. For those of you that have been living in a cave and have no idea of what I’m talking about, here’s the instant replay. Responding to a question from the Sioux Falls Argus Leader editorial board about calls for her to drop out of the race, she said: “My husband did not wrap up the nomination in 1992 until he won the California primary somewhere in the middle of June, right? We all remember Bobby Kennedy was assassinated in June in California. You know I just, I don’t understand it,” she said, dismissing the idea of abandoning the race. Clinton said she didn’t understand why, given this history, some Democrats were calling for her to quit. Of course, upon realizing she’d said something stupid, she immediately apologized, citing the Kennedy’s were on her mind because of Massachusett’s Senator Edward Kennedy having been diagnosed with a brain tumor. Right now, Clinton supporters are fleeing like rats deserting the proverbial sinking ship. I find it ironic that she holds Robert F. Kennedy’s former seat in New York. It will also be ironic that in a family that has always held the Kennedy’s in such high esteem that it should be Hillary’s downfall. 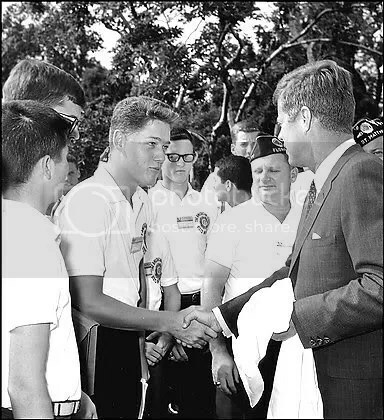 Bill had always claimed that JFK was his hero and during his campaign that picture of him meeting JFK when he was a boy was everywhere. I think maybe she should simply claim a momentary lapse of reason. We all have them. Like Flip Wilson used to say: “The Devil made me do it, The Devil made me do it.” “Doctor, you’re wanted in surgery, Mrs. Clinton needs her foot removed from her mouth.” Foot in mouth, debilitating politicians since the beginning of time. Well, Ebay has become the place for strange auctions. A couple from Berlin, Germany has put their 7 month old boy up for auction for one Euro, about $1.57. Peter Hieber, a spokesman for police in the Bavarian town of Krumbach, said the baby was placed in the care of youth services, although the child’s mother insisted the ad was only a joke. It’s not much of a joke if you ask me. Authorities have launched an investigation into possible child trafficking against the baby’s mother and father, neither of whom was identified. “Offering my nearly new baby for sale, as it has gotten too loud. It is a male baby, nearly 28 inches long and can be used either in a baby carrier or a stroller,” police quoted the Ebay listing. I wonder how much shipping was. No offers were made for the child in the two hours and 30 minutes the ad was posted on Tuesday. I’m surprised, that was a pretty cheap price for a rugrat. Ebay later deleted the posting, but assisted police in tracking down the parents. I wonder what Ebay policy this one violated. Not everyone is a fan of the new Indiana Jones movie. Members of the Russian Communist party are calling for a ban on the film because of Cate Blanchett’s portrayal of a 1950’s KGB agent. Russian Communist Party members condemned the new “Indiana Jones” film on Friday as crude, anti-Soviet propaganda that distorts history. Ya think? I’ve never looked to an Indiana Jones movie for a history lesson. “What galls is how together with America we defeated Hitler, and how we sympathized when Bin Laden hit them. But they go ahead and scare kids with Communists. These people have no shame,” said Viktor Perov, a Communist Party member in Russia‘s second city of St. Petersburg. Can you say, over-reacting? The film, was released in Russian cinemas on Thursday. Russian media said it was being shown on 808 screens, the widest ever release for a Hollywood movie. Well, a controversy never hurts to get folks into the theater. This could score a lot of rubles for Indy. I wonder what Harrison Ford sounds like in Russian. Do their lips sync or are they like those old martial arts movies from the 60’s. Because of pressure about the party pictures of him all over the internet, including this site, Vince Young has apologized, sort of. Vince apologizes thusly:”I apologize to some of the kids if they did see it because I am trying to be a role model for them. But at the same time, I was just trying to have fun with (friends). That is the life of a quarterback, somebody of my status. I guess somebody was trying to make some money and sold the picture to the web site. But at the same time that is the life I chose to live. But it is not going to stop me from having fun. I just have to watch myself. They always want to try and get some negative pub on me. It wasn’t really nothing bad. … Everybody deserves to have a good time every once in a while during the offseason.” Let’s see, every once in a while. Let’s check the QB’s schedule, shall we? Looks to me like every once in a while is every day. Liver transplant for Vince Young. Liver Transplant for Vince Young. If you follow the links above you can get a look at each one of the parties. They were careful not to show Vince actually drinking this time, but one actually shows the cops arriving at the Baby Blue Carpet Affair though you have to go through 10 pages of pics to get to it. Getting in shape for the pre-season, eh Vince.